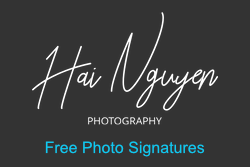 Watermarking, photos and the art and business of photography. For long uMark has supported inserting EXIF metadata as watermark. Now we have also added support for IPTC data in the macros. You can insert IPTC properties like title, by-line, copyright or whichever other IPTC values you may have set for the photo. The IPTC tags are listed at the end of the watermark macro list after the EXIF tags. You can now tell uMark to enter the date from the macros in the format you want. uMark supports numerous date macros from EXIF data - date the photo was taken, the date it was modified and such. Earlier there was no way to control what kind of date uMark inserted as watermark. Now you can. You can now format the date to be inserted as Day/Month/Year or Month/Day/Year or any other format with the separate of your choice. By using various placeholders you can include various parts of a date. 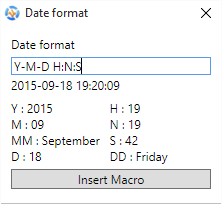 Default format is Y-M-D H:N:S which is entire date string. You can change the format the way you like and can instantly see the preview how the date will look like below. 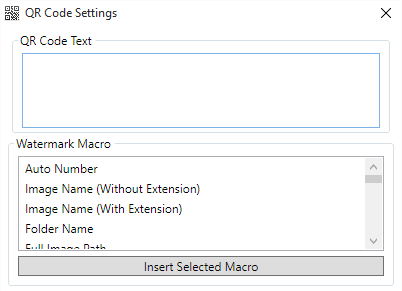 That is only for a preview, the actual date that will be inserted will be according to the macro you have selected in the format you have chosen. 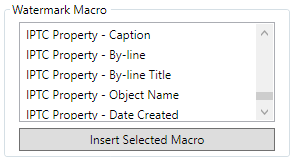 uMark will even remember the format for you so you don't have to set the format every time you enter a date based macro. We have added an option to add today's date in the macros. This date can also be formatted in the same way as mentioned above. This will come useful if you wish to add the date you are watermarking the photos as a watermark. You can always enter the today's date manually, but if you just use the macro and save it there's one less thing to worry about. You can now use macros in QR code watermark as well. So instead of having a static QR code on all photos you can have a different QR code on each photo based on what macros you include in the watermark. Include all metadata - This is the default option which copies all metadata from the original photo to the watermark photo. Include all except geolocation - This option will include all original metadata but remove any geo location info which may be embedded in the photo by your camera. This is a very useful option. If you have taken photos at your home or studio and if your phone camera or DSLR has included GPS coordinates in it, it is better to remove such information before you post the photos online. 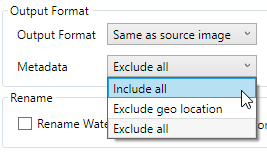 Exclude all metadata - This option will not include any metadata while saving your watermarked photo. This also means you can use uMark as EXIF data remover to strip all metadata from your photos. If you do not add any watermark but just use this option to save copies of your photos, you can get rid of all metadata from a photo without affecting your original photos. 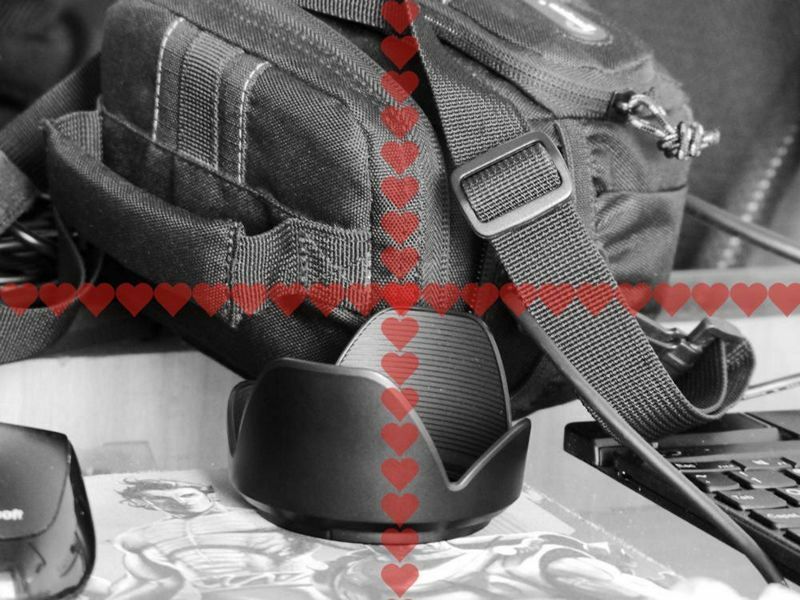 Till now you could only insert tiled watermarks at left most or top most edge of a photo and adjust it with padding, now you can place the tiled watermarks at 3 different positions depending on whether you want to tile horizontally or vertically. If you tile a watermark horizontally you can place it at top, middle or bottom, similarly a vertically tiled watermark can be placed on left, center or right of the photo. In this sample photo there are two watermarks one tiled horizontally and placed at center and another tiled vertically placed at center. You can save your watermark settings for repeat use so you don’t have to recreate them every time. uMark also automatically saves your last watermark so if you forgot to save it you can just reuse your last watermark. Now we are making it even easier - you can actually set a saved watermark to auto load whenever you open uMark. So you just need to select your photos and hit Save Photos button to watermark them. To set a watermark on auto load you need to save it first. After you save the watermark you need to click on the Add Watermark button and select Add Saved Watermark option. When the Load Settings window opens you can see a new button called Set Auto Load under your list of saved watermarks. Select a saved watermark and click on the button to Auto load the selected watermark when uMark starts. The watermark you have set for auto load will show up in bold in the saved watermarks list. You can choose another watermark setting to auto load by selecting it and clicking the Auto load button. 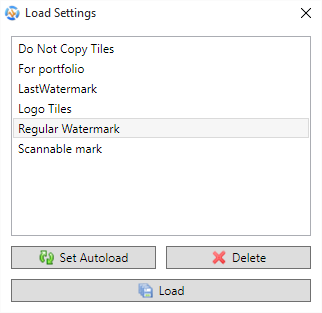 You can only set one setting to auto load, however within a setting you can have multiple individual watermarks. If you want to remove a watermark from auto loading, just select the watermark and click on the Remove Auto Load button. This was a major bug that we have fixed. uMark 5.5 now saves the photos with the original resolution of the photo so your 300 DPI print quality photo will be saved with 300 DPI. Apart from these features we have fixed some bugs which included a bug while importing settings from older versions of uMark. All the users of uMark 4 and 5 can upgrade to uMark 5.5 for free. If you have an older version of uMark you can upgrade to the latest version for half the price. Please note these changes have been made only to uMark for Windows and are coming to Mac version within the next couple of weeks so Mac users stay tuned. For Windows and Mac. Available in 8 languages - Dutch, English, French, German, Italian, Portuguese, Spanish and Turkish. How to prevent people from copying your photos without your consent?